During the IFA event held at Berlin, Sony introduced their latest flagship smartphone which will change your perception of how a smartphone can be made. The Sony Xperia Z3 is a fantastically designed and value for money featured smartphone which still looks similar to the Sony Xperia Z2 but if you look closely it still has a much greater outlook and an outstanding goodness inside of it. I know you expect it to be a Quad HD display, but Sony remains with the Full HD display despite there are still not much contents made available for that resolution at the time being but the Full HD is more than enough if you ask me although anything latest you get is still better when you talk in term of logic. The Sony Xperia Z3 comes with 5.2-inch IPS display with 424 of pixel density. You get a much improved processor, the upgraded version of Snapdragon 801 ( 8974AC ) clocked at 2.5GHz with Adreno 330 graphics for a great gaming experience. With the Sony Playstation 4 remote play feature on the Sony Xperia Z3, you can now play all your Playstation 4 games on the go via the Sony Xperia Z3 itself. If it could support such thing, can you imagine how good the graphics will be? The RAM still remains at 3GB of RAM while the internal storage ( RAM ) comes in two variants, either 16GB or 32GB and still with the option of expanding it with a micro SD slot which supports up to 128GB. The back camera remains same according to Sony, with their 20.7MP shooter which comes with BIONZ technology. The only change according to them is a new 25mm wide angle lens has been replaced with the previous one and yes it is the updated version of their G lens. No upgrade made on the front shooter as it is set at 2.2MP rather than the widely available 5MP or 8MP front camera. The dust and water proof has now taken to a whole new level as the Sony Xperia Z3 is now IP68 certified instead of the IP58 which is on the Sony Xperia Z2. Sony also claims that the front facing speakers are much louder now compared to the previous one introduced on the Sony Xperia Z2. With the S-Force Front Surround the audio output is much clearer, louder and excellent noise cancelling capability. The Sony Xperia Z3 now comes with a lower battery capacity of only 3100mAh compared to the Sony Xperia Z2 which has 3200mAh. But hold on, Sony also claims that the battery on the Sony Xperia Z3 is capable of lasting up to 2 days even with much heavier usage on the Sony Xperia Z2. What do you say? Technology evolves that fast, kudos to the inventors! It comes out of the box with Android KitKat and will be soon upgradeable to Android L the very moment it is made available officially too. The Sony Xperia Z3 now uses Nano SIM technology compared to the micro SIM which available on Sony Xperia Z2. Lastly, the Sony Xperia Z3 is much thinner than the Sony Xperia Z2, 7.3mm vs 8.2mm is defenitely a great work and as some of you complained that the Sony Xperia Z2 is kind of bulky when you hold it on your hands, problem solved now and make sure upgrade your smartphone to the Sony Xperia Z3 the very moment it is made available. 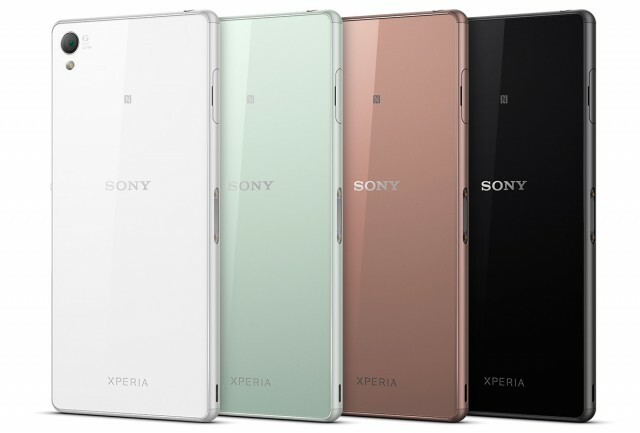 Oh, the Sony Xperia Z3 will be available in 4 different colors, white, black, copper and silver green.